Purified Glacier Water, Herbal Blend of *Horsetail Herb, *Marigold, *Burdock, *Sunflower Oil, *Sweet Almond Oil, *Rosemary, *Certified Biodynamic Avocado Oil, *Lotus Bean; *Olive Oil, Coco Polyglucose [natural potato and coconut oil-based surfactant), * Vegetable Glycerine, *Hempseed Oil, *Guar Gum, Whole Oatmeal & Almond Meal Paste, Orange Extract (Vitamin C), *Lavender Oil, Olive Leaf, Salt, Blueberry Extracts, Canadian Wildcrafted Red Clover. Oatmeal has been used by the Egyptians and Arabians as a skin beauty treatment and by the Romans and Greeks as a bath for skin conditions since as early as 2000 BC. Oatmeal removes dead skin cells, restores natural moisture balance and continues to be used to soothe dry, itchy, irritated skin and numerous skin disorders. Almond Oil is a great emollient and lubricant, restoring moisture in the body and combating itching and inflammation. Rosehip Oil has been used for generations to maintain healthy skin. With its wonderful healing properties, rosehip oil hydrates the skin and nourishes a dry coat. The Burdock Root plant has been used to treat both bacterial and fungal infections because of the phytochemicals it contains. Safflower Oil provides relief from inflammation and rashes and soothes skin irritations. It is nourishing and moisturizing to skin, and naturally conditions a dog's coat, leaving it soft and silky. Grape Seed has a high content of linoleic acid, a fatty acid essential for healthy cell membranes and skin. Grape seed oil serves as a wonderful, nourishing moisturizer. Naturally antiseptic Rosemary has been used to prevent fur loss, alleviate dandruff, relieve both skin dryness and pain, and stimulate coat regeneration. In addition to its vitalizing scent and aroma therapeutic properties, it will leave your pet's coat radiant and fresh-smelling. Biodynamic Avocado Oil, a natural sunscreen, is mild, good for sensitive skin, and rich in vitamins A, C, D & E, amino acids and minerals. Biodynamic Macadamia Oil, pressed from the Australian macadamia nut, nourishes dry skin and moisturizes the coat, leaving it soft and silky. Kakadu Plum is an Australian wild-harvested fruit and is the highest known fruit source of Vitamin C in the world. The highest form of antioxidant found in nature, it is used worldwide to refresh and revive the skin. Jojoba Oil moisturizes and rejuvenates tired skin weathered by the elements. 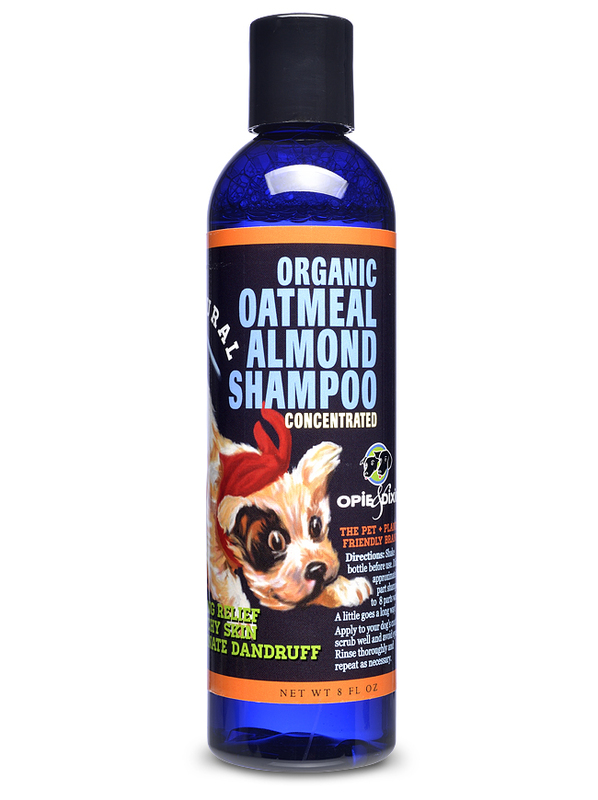 Like both macadamia oil and safflower oil, it naturally conditions the coat, leaving it soft and silky. Citrus Seed Extract, derived from the seeds, pulp and white membranes of grapefruit provides antibacterial, antiviral and anti-fungal properties. Canadian Wild Crafted Red Clover is used as a poultice to treat skin conditions. It contains high amounts of vitamins, minerals and proteins, including calcium, iron, magnesium, potassium, silicon, niacin, thiamine, and vitamins A, B-12, C, E and K.
Wet your pet well. Dilute and apply enough shampoo to create a gentle lather. Massage shampoo deeply into the fur. Rinse thoroughly. Send your pup off on his or her merry way, looking, feeling and smelling clean, fresh and fabulous!